Is it weird to post a salad in February? It’s weird. But I don’t care because lately I’ve been eating like crap since I haven’t been feeling ???? and now that I’m starting to come back to life I’m craving all things SALAD. If you guys have been here a while, you know I love me a good salad. Winter, spring, summer or fall – salads have a place in my heart and I feel like this Simple Spring Mix Salad is the perfect transition from winter to spring. Here are the three things I always think about when making a salad. Color – I try to have different colors going on, so things pop and look appealing to the eye before you dig in. Texture – This is the most important thing to me. I want ALL the texture when it comes to salad. Crunchy, creamy, soft, you name it. Size – You want a salad to be fork friendly, meaning ingredients should be cut about the same size and easy to eat without getting smashed all over your face. Another REALLY important, actually the most important part of a salad, is the dressing. Homemade salad dressing will change your life. I repeat. HOMEMADE SALAD DRESSING WILL CHANGE YOUR LIFE. I promise you, it SO very simple to make, and you’re gonna love this wintery Maple Balsamic Dressing. So if you’re like me and can pretty much taste spring, go ahead and give this recipe a try. You’re gonna love it! 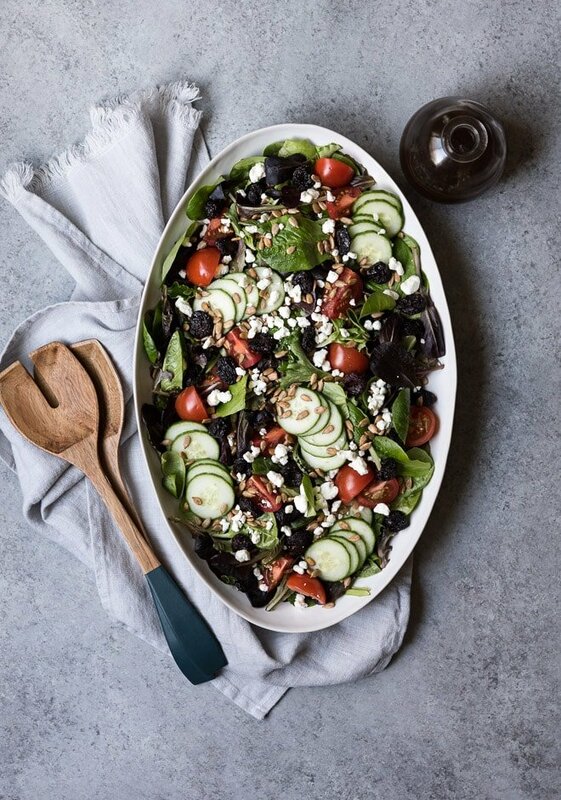 A simple and delicious spring mix salad made with baby greens, tomatoes, cucumber, dried cherries, sunflower seeds and creamy goat cheese, drizzled with a maple balsamic dressing. Add the greens, tomatoes, cucumbers, dried cherries and sunflower seeds into a large bowl or platter. Toss lightly with desired amount of dressing then top with crumbled goat cheese. Whisk everything together until emulsified. Store remaining dressing in the fridge for 1 week. Cant wait to try this! I’m all about dried cherries right now. YUM! I tried your lemon pasta with artichokes and it is delicious! Thanks for giving me(cooking for 39 years) some new recipes I can get exited about!